I am pleased to be talking with Sam McClure. 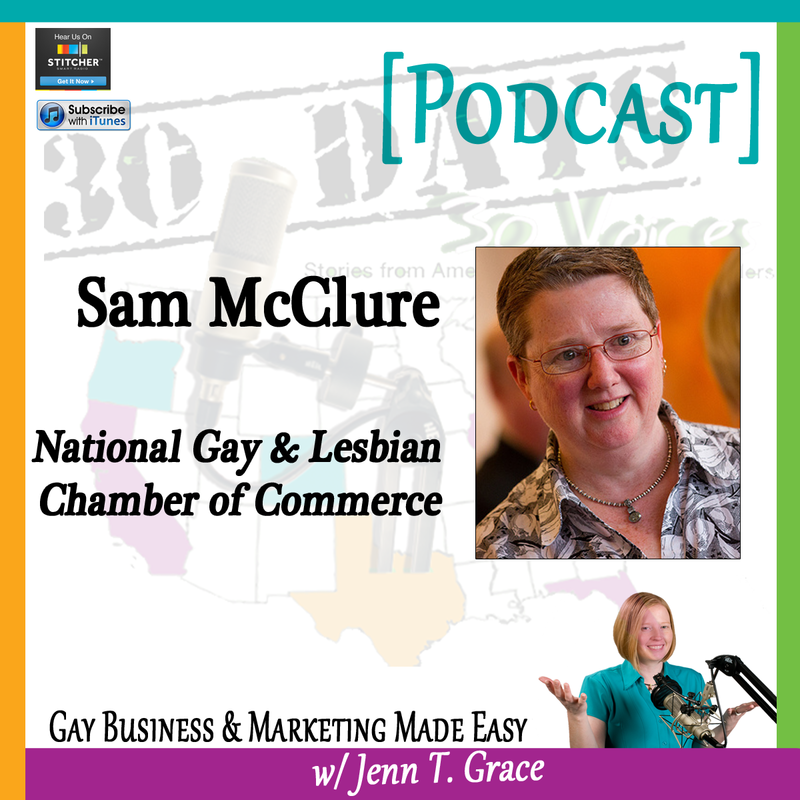 She is the Director of Affiliate Relations and External Affairs for the National Gay and Lesbian Chamber of Commerce. Prior to this she was the Executive Director of Quorum, which is the Minneapolis, Saint Paul LGBT and Allied Chamber of Commerce. And in addition to these roles she has previous experience owning several small businesses. So Sam, I’ve given the listeners a brief overview of who you are, but why don’t you tell us a little bit more about yourself and what your path looked like that led you to where you are today. Well thanks Jenn, and I just want to say thanks again for having me on your show, it’s really a pleasure and looking forward to our interview. So a little more about me. I’m here in Washington D.C. at the headquarters of the National Gay and Lesbian Chamber of Commerce, and I just moved to D.C. and joined the team here internally almost two years ago. But I’ve actually been with the NGLCC since really the very beginning. You know the organization just celebrated our tenth anniversary, and I was part of the earliest days when our co-founders created the NGLCC and came to one of the earliest conferences as a volunteer board member for a local chamber, Quorum, that you mentioned in the beginning. And you know I was quite taken with this whole concept of business equality as a movement and intentional inclusion of LGBT-owned businesses in the economy and the network of other LGBT chambers around the country. And also the corporate partners that were coming into the space to be part of this movement to leverage economic development opportunities specifically for people who are LGBT. I got really excited about the movement right away, I became a volunteer leader in the chamber council at that conference, and I served as the chair of the Midwest region and then after a few years I became the national chair of that chamber council. And then eventually made the transition to becoming internal staff member of the NGLCC. And it’s been a really amazing path. I frequently tell people that I have the best job ever, and I get to do work I’m very, very passionate about. I’m grateful for that. It seems like in this case, it seems like a very clear path that you were on starting with your work at Quorum, but I know that you do have experience running several businesses as well. And I’m going to ask you a- just a random fun fact or a tidbit about yourself, and I know that that will factor in your past business experience. So for those listening, why don’t you share something that’s just maybe random about yourself or something that very few people know or would expect to know from you. That’s a great question. Well, I think- I think one thing that a lot of people don’t know about me is that I have a conservatory education and I was on the path towards an arts career early in my life in my path. And at some point along the way, while I was at the conservatory, really enjoying being a musician and playing a lot of different ensembles and so forth, I discovered a curriculum there called Piano Technology. I got really interested in it and I went down that path and actually studied piano technology and became a piano technician, and actually started a business in that field while I was still in school, and I worked in that field for ten years. And you know my path- my career path ended up taking a real different direction later on, but that early path was very much focused in that very unique field. I did everything from the most basic tuning and maintenance of the family piano to historic restorations and period instrument building, and it was a great experience. I still have a lot of love and passion for the piano and that was just a really interesting time in my life. And I stayed in the business and did everything I set out to do, and then decided to go in a different direction. But that’s something that a lot of people don’t know about me. Very interesting. And did you have an ‘ah-ha’ moment, or maybe it was a series of ‘ah-ha’ moments in your past career, where you just realized that what you’re doing now is what you should be doing in life? Oh so many of those ‘ah-ha’ moments. I could talk all day about all the moments that I’ve had where I knew that being a professional business advocate was exactly what I needed to be doing. I think one of the most salient for me that I always think back on was- and this was while I was a- it was early in the days while I was being the very first paid executive for Quorum in Minneapolis, Saint Paul. I had one of our business members request a meeting and we had a lunch meeting, and she basically just wanted to talk about the way forward for her business; she had a really interesting, innovative product line. And she was really clear on the creative part of her business, but she was looking for guidance on growth strategies and how to navigate to find opportunities and leverage the growth of this new venture. And I took about ninety minutes with her and we just talked through all the different possible paths that she could take. And it was a really interesting and powerful meeting. You know, I was enjoying the conversation because I’m really interested in business strategy and I love talking business strategy. But at some point I recognized that you know, this business owner was having that light bulb moment over and over in the meeting. And at the end of our meeting she just expressed to me how grateful she was and what a big difference to have an opportunity to get someone to sit down and just provide some guidance and some free counsel, and just basic support on how to move forward as an entrepreneur. And I realized that ninety minutes had gone by and I had been really working hard. However, it wasn’t work at all. I was just doing the thing that I was really passionate about and I could see across the table that I was having real impact on this business owner and her path, and her ability to navigate forward. And you know I kind of left that meeting going, “Oh, yeah. I’m a business advocate. Like this is what I’m supposed to be doing. You know I just spent ninety minutes doing what someone might have thought of as work.” For me it was just really fun, and it had a huge impact. And you know that was a powerful moment that I’ll never forget. And you know since then I’ve had hundreds and hundreds, maybe thousands of meetings like that. And it’s just- I just feel grateful to have the opportunity to do that and to have it really have a significant impact on the lives of people. And you know to be able to serve the LGBT business community specifically, that’s very gratifying to me and exciting. I think the work we’re doing changes the landscape of what people think is possible for their businesses. And that’s brilliant and exciting work, and I just feel grateful every day that I get to do it. That’s really awesome. It totally sounds like you are inspired by what you do and you certainly do not lack motivation in terms of helping all of the business owners and advocates and chamber leaders and everybody across the country that you’re helping on any given day. But what is your inspiration and what does keep you motivated to continue doing this work? Because we know that this work isn’t always easy, but it is always rewarding. So what keeps you motivated and inspired? Well I think it comes back to that concept that I just mentioned about changing the landscape of what is possible for people. You know I look back on my own career; you know I started a business when I was about twenty- actually it wasn’t my first business, but it was the first major business. And you know, I remember that time really, really clearly and I have to say at twenty years old, it never occurred to me that my sexual orientation, my identity as a person who is LGBT, could be a tactical advantage. That it was really- could be part of my business in a way. I just thought of them as completely unrelated. And it was at a time when it wasn’t necessarily ideal to be out, and it took me a long time to really fully embrace who I am and live in a completely authentic way. And you know, I look around where we are now and my work at the NGLCC and with the local chambers and speaking engagements that I get to do around the country, and I love those moments when there is someone in the audience who’s maybe still in graduate school or in college, who’s thinking about an entrepreneurial path. And you recognize that for them, that landscape of what is possible, it’s completely different than it was for people like me twenty-some odd years ago, I don’t want to say how many years ago. But over twenty years ago, closer to thirty years ago. And you see, you know here’s a young entrepreneur who is starting out with all of these amazing resources, a National Gay and Lesbian Chamber of Commerce, the LGBT supplier diversity initiative, their local LGBT chamber of commerce. You know that’s amazing. Like the landscape of what is possible is completely different. And that keeps me really motivated and excited to know that we’re changing hearts and minds in that way, and that people are navigating their experience as entrepreneurs with so much support. You know one of the things I do when I’m talking to audiences and we’re talking about economic development, I draw this chart of a supply chain and it basically demonstrates to business owners how their success is all very interrelated and that no business succeeds in a vacuum; that we’re all there to support each other. And I think I often see this moment out there where the business owner is like, “Oh,” all of a sudden they get it. They have that moment where they’re like, “I see how I fit in this larger picture and this larger movement.” And that’s also really, really inspiring. Those moments just really keep me going and just make me want to jump out of bed every day and get out there and talk with more people and help them understand how amazing the opportunities are right now. It’s so great to be in a position where you do just want to hop out of bed because you are so excited about what the day is going to bring. And in hearing what inspires you, you mentioned a couple of things that if you don’t mind, I would love for you to elaborate on just a little bit so for anyone who’s listening to this so they have a better handle on specifically what the supplier diversity initiative is. And then also what the function of an LGBT chamber of commerce is. Okay, well and I’ll take those in reverse order. You know the LGBT chambers of commerce- you know there’s local chambers all around the country, and then there’s the National Gay and Lesbian Chamber of Commerce here where I work in Washington D.C. And really all of these organizations exist in order to organize and advocate for those business communities that are people- businesses that are owned by people who are LGBT and allies of the LGBT community. The local chambers are largely focused on membership and local networking and business engagement opportunities. And then the National Gay and Lesbian Chamber of Commerce which serves as an umbrella to all those local organizations, is focused on the LGBT supplier diversity initiative which is- the initiative is designed to certify that a business is 51% owned, operated, managed and controlled by an LGBT person. And the supplier diversity initiative and the certification were created because there are- you know out there in Corporate America, there are businesses, many, many businesses, who have supplier diversity programs that are designed to make sure that their supply chains, and the opportunities for vendors within those supply chains are as diverse and inclusive as possible. They work strategically to leverage opportunities for businesses that are minority-owned or woman-owned. And you know the most innovative and forward-thinking inclusion in that space of supplier diversity is LGBT-owned businesses. And the NGLCC created the LGBT supplier diversity initiative and the certification so that we could actively advocate to open up those strategic growth opportunities to businesses that are owned by LGBT people. And you know, we work with our 140 corporate partners to make sure that those opportunities are getting to those business owners. And also that the ever-growing number of certified LGBT-owned businesses are also finding ways to do business with each other as well. You know back to that concept of- I was talking about the diagram of the supply chain; it really is true that all business development and growth is completely interrelated. You know when one business succeeds, it brings many, many other businesses along with it. And that’s the area that we work in. That ever-expanding, interdependence between businesses that are focused on growth. That is fantastic and is a great overview of both of those things, and really the work that you’re doing. And it leads perfectly into my next question for you. 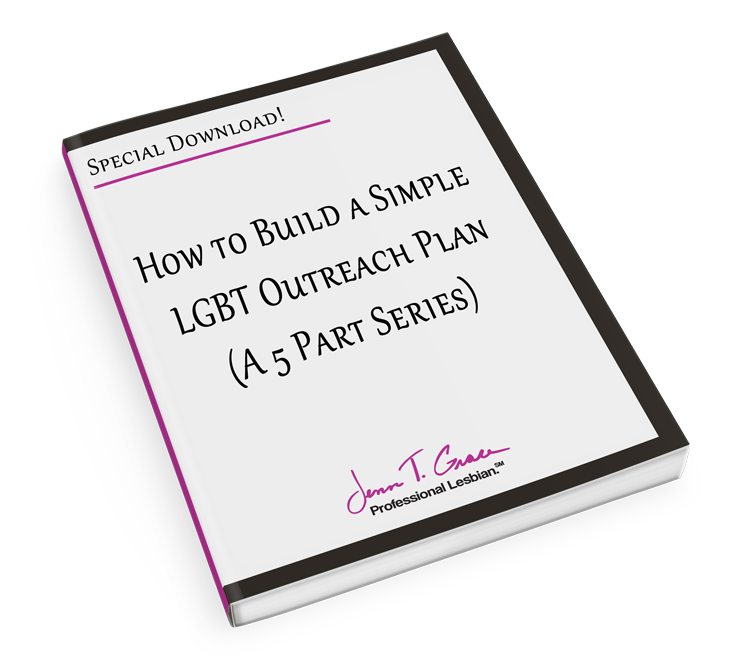 Which is for someone who’s listening to this, if they are an LGBT business owner, or perhaps they are an ally to the community that is in some sort of profession where they’re really just trying to market their products or services to the LGBT community. Do you have any advice that you would give them that you feel would enable them to be successful in that endeavor? This is a tough question. I mean the simple answer is talk to a pro. 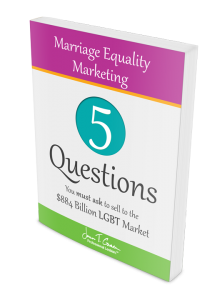 Definitely engage with a marketing expert, and someone who understands how to market to the LGBT segment. Frankly someone like you, Jenn, how has high levels of expertise that can help to provide strategies because you definitely need the expert advice. The other thing I would say is just some caution around the mythology of the market segment. 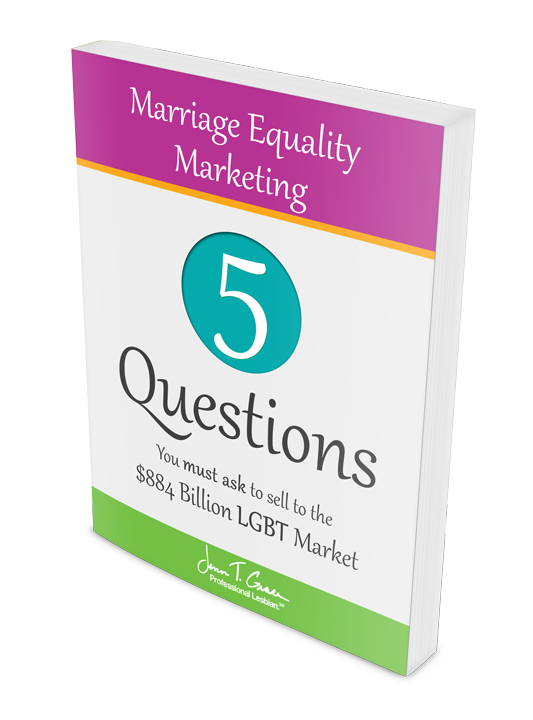 So obviously the LGBT market segment is incredibly attractive, we have huge numbers in terms of buying power. And perhaps more importantly a very steep trajectory of growth as a market segment. And I think that’s very attractive However, you know one of the myths out there that I think causes a lot of challenge for people trying to navigate this space is making assumptions that the LGBT community is monolithic in any particular way. That we all have the same political ideology, we all have similar lifestyles, similar incomes and similar spending habits. And while there are commonalities between people who are L, G, B or T, it really is at least four different segments in there based on whether someone is L, G, B or T. And then there’s also the reality that this is the one diverse segment that contains every other. So a person can be LGBT, and be a man or a woman, a person of any ethnic background, a person with a disability, a person who’s a veteran, a person of faith. And those are a lot of complex identities and so that’s- I guess that’s my one warning. Is understand the complexity of the market segment and try to think expansively. You know, it’s sometimes people get too overly targeted and they mis the mark because of that. I mean here’s a simple example. So you know I’m a typical LGBT business person in a way. I fit that market segment. And I often have conversations with particularly big commercial entities that are talking about their LGBT marketing strategy. And they are telling me that, “Well of course we have a full page ad in every major LGBT publication.” And yet they tell me that they’re looking for- like they’re trying to market to business owners and entrepreneurs, and I’m always like, “Well, do you have an ad in the New York Times or the Wall Street Journal or the local business journal? Because I read those.” And sometimes people miss that. Like they think, ‘Well if I’m trying to get an LGBT audience, I’ve got to be inside of a magazine or publication that’s targeted towards those people,’ without realizing that that publication also has some other focus. Like maybe it’s a lifestyle magazine, or something. Whereas if you’re trying to get a business person, you need to be in a business magazine. You know so it’s about thinking expansively and realizing that LGBT people are in every type of profession, and in every place geographically as well. So you’ve really got to do your homework and be aware of those myths that are out there. That is very well said, and really good examples of that so thank you for that. 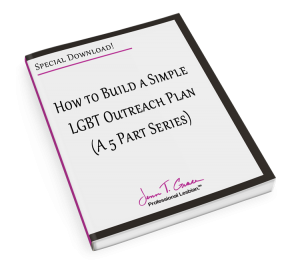 I’m sure those who are listening can appreciate that and really use that to their advantage when they’re putting together some sort of marketing plan. So my next question for you is around being a member of LGBT community yourself. And if you’ve found ways to leverage that status in your business profession. Well I mean certainly- it’s interesting you know, because I work for an organization that serves in the LGBT space, you know my title- you know when someone says my title they sort of recognize that the odds are good that I’m an LGBT person. So I’m many years past the concept of choosing to be out or not, it’s just I don’t even think about it at this point. But I will say that you know, in my work here in Washington D.C. and also throughout the time that I’ve been working as an LGBT business advocate, I’ve noticed that I have- I sometimes navigate this sort of outsider space. Like for example if I go to a big meeting full of many, many LGBT organizations, I’m generally the only business person. And I’m an outsider in that respect. And if I go to a big business event that’s a bunch of business organizations sitting around a table, then I’m often the only person who’s LGBT. And I’m an outsider in that way. And also, you know here in Washington I’m someone who came here from another place as many people are and sometimes that has that outsider effect as well. And I will say that I’ve come to recognize that as a real strategic advantage. You know oftentimes you’re recognized as having a different voice, or a voice that is- that you’re representing a larger group, and that’s been a huge advantage for me in a space that I’ve come to understand as very advantageous at times to always embrace that perspective and be willing to be a voice for the communities you represent; whether it’s your LGBT community or your community of entrepreneurs, or whatever community it is. It’s just to take that mantle and try to serve in those spaces. And it’s worked well for me. So I guess in that respect, all of my identity, all of my identities I should say, have been advantageous in different spaces. That’s really interesting, and I would imagine that like you were saying it’s to your benefit to have that outsider perspective or just being on the outside in many of those situations. I feel like it must give you such a more broad view of the situation versus someone else sitting around that table. I do think it does. I mean I certainly see it that way, and I would also just add that I think authenticity is very, very attractive in business. It is very, very attractive. And I think sometimes we go into spaces being concerned about our differences, and when we walk into a space and embrace who we are and represent all of who we are with authenticity, that is very attractive to business leaders because you know they want to connect with people. And I think it’s easy to connect and trust someone who feels completely authentic. And I think for LGBT people, you know being out is part of that. And it’s also about being authentic to every other complex layer of who you are. That’s really, really interesting and good advice and another good transition into my next question for you. Which is around business advice; do you have any one particular piece of advice that you’ve been given in the past that’s just kind of your guiding principle for the way you go about business now? Again I have so many possible answers to that. But I’m going to go with one that wasn’t actually a piece of advice as much as it was a day-to-day example. And I picked this up from one of my early mentors early in my career. And that is to be friendly and open and authentic in every interaction that you have and with every person you meet, regardless of your perception of how valuable they are to you or what their station is. I worked with a gentleman many, many years ago who- he had a very high position in a company, probably number two. And he used to enter the business every morning through the back door. And he would stop and make eye contact and say a cheerful, ‘Good morning,’ to every single person that he passed from the back of the building all the way to his front corner office. And I observed this many, many times, and frankly sometimes it was a little annoying because it took him like twenty minutes to get to his desk. And I was always like waiting and ready to have our meeting and so forth. And you know one day I finally just asked him about it. I was like, “You know, you spend a lot of time on your good mornings. It’s like what is going on there?” And he just said to me, “Well, do you ever notice whenever we have a problem in our department and we have to call another department to get help or support how quickly they come to help us?” And I was like, “Yeah. Yeah, I do notice that.” And he was like, “Well it’s because we have a real relationship. We have a real connection. You know it really makes a lot of sense to take time to have a positive interaction with everyone you meet.” And that simple thing- eye contact and a good morning. It is so, so powerful. And I really work hard to do that, and it’s interesting trying to do that in Washington D.C. you know, it’s a big, big, very busy city and everyone is hustling and bustling in all directions, and people are often a little bit startled by the ‘Good morning.’ But you know it makes a difference. And at the end of the day you’re setting the tone for your communications and your relationship with that person forever. Just by initiating a genuine, positive interaction every time. And I just think that those- for business people, that’s an incredible, incredible piece of advice and it’s made a huge difference for me and how I relate to other people. That’s great advice, and it seems like something that someone listening to this could begin taking small steps to really implement. It’s not something that’s really overwhelming; it’s just baby steps. So my next question is do you have a business book or some sort of program or tool that’s just really helped you go about business? I have so many, again. But I think the most important book to me is one that might surprise people because it’s a Dr. Seuss book. Very early on in my career a really, really smart mentor happened to be my dad, gave me a copy of ‘Green Eggs and Ham.’ And he kind of contextualized it that this was an opportunity to develop some business skills reading this book. And I can remember being quite dismissive of it like, “Really? You want me to read Dr. Seuss?” But here’s the thing about that book. It’s all about getting to yes. It’s in terms of our ability to close deals or even to land an idea in a collaborative environment. You know the ability to get to yes is a critical, critical business skill. And if you look at the book it has all this different things, you know first it’s like, ‘Do you want green eggs and ham? No, well how about spam? How about this?’ I mean it’s all about navigating and being flexible and understanding that there’s a way to get to yes and really not giving up until you get there. But doing it in a way that’s engaging and you know feels genuinely like you’re really just trying to help the other person get to what they want. And you know, that is such a critical business skill. You have to have it to close deals, you have to have it to negotiate effectively. And you know it’s just the simplest technique but it works every time. So I rely back on that a lot in my mind. I’m also a really big fan of the book, ‘Oh the Places You’ll Go.’ And I frequently read it when I need a shot of positive energy or encouragement. That’s a popular one. That, I believe was that book that was read at my undergrad graduation ceremony. And I have not read ‘Green Eggs and Ham,’ although I feel like I should have, having a four and six year old. So I’m going to have to go dig through their bookshelf to see if I can find that here. Because I feel like your ability to take something so simple as a Dr. Seuss book and really apply that to business is really interesting, it makes me want to go read it. So I have one last question and then we will say goodbye. And I’m just really curious to know what is one thing right now in your business, at your workplace, that’s just really exciting for you? Oh, whittling it down to one for me is very difficult. Very, very difficult. The work we do is really, really exciting. I think the thing I’m most excited about right now has to do with business inclusion work on a very, very broad scale.  You know the NGLCC founded a group a few years ago called the National Business Inclusion Consortium, which brings many of the other organizations that do business advocacy specifically to communities of identity. And it gets us all around a table together, and you know we founded it because we recognized that there’s common goals for all these organizations; even though one organization serves ethnic minorities, and another organization serves women, and another organization serves people with disability and we serve LGBT. We’re all advocating for strategic growth opportunities for our business owners. And we found a lot of ways to work together. And I just recently did an event in Boston, and you know we were talking to an audience that included all different types of people and we were talking to them about number one, there’s a certification for you, and there’s supplier diversity opportunities specifically tailored for your business. And number two, all of these people need to be working together, not just the national organizations, but the business owners. And there’s no reason that a business owner who is a woman and you know their colleague who is a person of an ethnic minority who also is a certified business, and a certified LGBT business; shouldn’t be all working together. Either in that client relationship or teaming together so that their businesses have more scale and they can approach larger opportunities. And you know this was a relatively new concept, just a couple of years ago, and now to be in front of an audience and seeing it get real traction, and seeing business owners looking at each other and saying, “Oh, we should be working together. We’re in a similar field, let’s join forces and be stronger together.” That’s very, very exciting. And it gets back to that concept that businesses just don’t succeed in a vacuum. You can’t be isolationists and grow. You have to connect with others. And for us to take all these different communities that are perceived as minority and put them together, like the whole concept of minority just gets turned upside down, right? Because these communities are big, and these business communities are big and they’re strong. And together, you know these businesses are just a force to be reckoned with. And that to me is very, very exciting. That’s really awesome, and your interview is happening in the early part of this particular podcast series. So as people are listening to this, they can look forward to hearing a lot of the voices that you’re just kind of describing now where they are woman-owned businesses, or LGBT-owned businesses. And many of them are working together already, just within my thirty interviews here, and I’m already working with many of them too. So it really comes back to what you might have been talking about earlier on which is bringing those communities together and creating those opportunities for the communities. Well that’s fantastic. And you know I would just say you- you know I’d love to take a minute and plug the NGLCC conference which is coming up really soon, July 30 through August 2 in the beautiful city of Dallas. I know you’ll be there, I’m looking forward to seeing you and many of your colleagues. And I would just say to people that you know, if you’re interested in LGBT business equality, this conference is the epicentre of the business equality movement. It’s where everyone who’s a player in this space comes together, we celebrate each other’s successes, we support each other. The conference has gotten very big. I remember in the early days when it was quite small and it’s become a very large event; I think we’ll probably have 700-800 attendees this year. And it’s like the one time of year where you can be in a space where literally everyone around you just wants you to succeed, and they just want to help you. And I think in a business environment that is a very rare space indeed, and I would just encourage your listeners, if you’re an LGBT business owner, or a business owner that’s navigating the supplier diversity space with some other type of certification, or you consider yourself an ally and you want to be part of this powerful business movement, you know come to the conference. It’s just an incredibly powerful experience, and I look forward to meeting as many of you as possible. That is awesome. And I have talked about how powerful the conference is in several of my past podcasts because it really is that one time of the year where I personally feel like I am just- it’s like a family reunion to me. I feel like everybody there is- they’re really genuine, they’re authentic, and they truly want to see you succeed. And I feel like there’s no other conference where I’ve had that powerful of an experience. And every year I meet new people and I just continue to develop and build previous relationships. And I always walk away with tons of things to do, tons of new ideas, and many new contacts that I can start doing business with. So I can totally reiterate your point of if you’re listening to this you should definitely take the time and come out to the conference and I include a list of links that were mentioned in every one of these podcasts. So I will make sure that there is a link to the conference in there, so if you are interested, it will be easily accessible for you. So Sam, thank you again so much for talking with us today. I feel like your information is so valuable. And if anyone wants to get in touch with you, how would you recommend they do that? Oh well there’s so many ways. I mean certainly I think we’re all pretty accessible here, the website for the NGLCC is www.NGLCC.org, lists all of the team members. You know my email is listed on there. I’m pretty active in the social media space as well, and I’m also just all over the country. So if you have a chance to meet me in person I would look forward to that. I do a lot of speaking as part of the NGLCC road show, so if you see the road show is coming to your area, I would encourage you to come on out and participate and I would look forward to every opportunity I have to connect with the entrepreneurs and business leaders out there. You’re my people, I love to connect with you. So, yeah. That sounds great. Thank you so much and we will talk soon. Alright, thank you so much Jenn, I really appreciate being on your show and I look forward to doing it again soon sometime I hope.